In several of the MWC conference sessions, speakers talking about breakthrough 5G services inevitably referenced mobile health applications and even remote surgery. But while some talk, the 5TONIC co-creation laboratory in Madrid builds. Arturo Azcorra, the VP of the 5TONIC lab, explains how a 5G T-shirt could help save lives. Imagine if that very smart T-shirt you were wearing was actually really smart. As in connected smart. And imagine if it could read, hold and send data about you and your condition over a mobile network to a doctor or an emergency services team. That’s the project that the 5TONIC co-creation team are working on alongside the medical technology experts of Madrid’s Emergency services operation. The project is based on the fact that, in emergency situations, the sooner a critical patient gets appropriate medical attention, the far greater the chance of survival. But in situations when someone collapses in the street, passers-by coming to their aid can only provide the barest of information to the emergency services. They can make a call, they can speak to an operator, and explain where they are and what they have seen – but the crew arriving on site will have virtually no medical history for the patient. Now imagine this. You are a patient with a pre-existing, potentially, critical condition. Maybe you suffer from very high blood pressure, a weak heart or acute diabetes. The hospital equips you with a device you can wear all the time – in the laboratory the team are using a T-shirt but it could be a bracelet or something similar. The shirt includes sensors that constantly monitor your condition – sensors that could notice a deterioration in your condition even before you become fully aware yourself. The T-shirt also knows enough about your medical condition to spot danger signs and it constantly and precisely tracks your location. It also knows the best hospitals to treat your specific condition, as well as those closest to your actual location at any given time. Now, even before you collapse in the street, warning signals that you could be in trouble are relayed to the control centre. Your health records, vital signs and an intelligent diagnosis are immediately available, as well as your current exact location. As things take a turn for the worse, the data continues to flow, and the ambulance crew may be on their way to you even before you hit the floor. And of course, when the crew arrive they know everything they need to know about you, can have been briefed by experts on actions to take at the scene, and are in constant contact with the right hospital to get you the right treatment. This smart T-shirt can take vital minutes out of the response times and ensure that those arriving on the scene don’t lose further valuable time trying to assess what needs to be done. If you cut in half the time between incident and treatment, you exponentially increase the survival rates. And if all that was not ‘smart’ enough for you – here’s another little trick this T-Shirt and a 5G network has at its disposal. What if that collapse happens in a basement, or on a metro station platform with no network coverage or Wifi service? In that instance, the T-Shirt would take advantage of the device-to-device capability of a 5G network and find its way to a signal. Because even if your device has no coverage, and the device of another person near you has no coverage, they can still see each other and exchange data. So, the T-shirt sends the vital data to another smartphone, and that one relays it to another, with these devices all the while looking for a handset that has internet access. Because as soon as the data hits a device with coverage, it hits the internet and goes straight to the emergency services so they can spring into action. In fact, the qualities of a 5G network are vital for this type of service. Network slicing means that the emergency services can have a dedicated priority slice of the network for emergency situations; the fact that 5G devices will be up to 90 per cent more energy efficient can make the battery small enough for such devices to be feasible; and the sheer capacity of a 5G network makes it possible to have all these additional connected devices. A 5G network can even accommodate ‘closed user groups’ which means that using the device-to-device facility our T-Shirt might be able to locate a registered first-responder, say an off-duty doctor, who is on the same metro station platform as our patient and can be given the same access to patient data. This scenario is not some far-off vision of the future. As I said at the start, this smart T-Shirt is being developed, built and tested right now in the 5TONIC co-creation laboratory in Madrid in conjunction with the City’s emergency services experts. It is just one of a number of visionary projects based on the capabilities of 5G networks that are being developed in the laboratory and test facility. The opportunities and scope created by 5G are bigger than any one company can comprehend or deliver. That’s why the 5TONIC laboratory brings together, in partnership, companies such as Telefonica, Imdea Networks, Intel, Ericsson, Commscope, and other members to work on projects alongside innovative collaborators and partners from vertical market sectors such as Madrid’s emergency services team. The idea is simple – to help ideas grow into development projects, to turn development projects into potential products, and to build the business models that can support the delivery of those products across 5G networks. It is a simple idea, but it needs a laboratory and a dedicated team to make it happen. And in the case of the emergency services in Madrid, 5TONIC is literally designing, building and wearing the life-saving 5G T-shirt. Arturo Azcorra is the founder and Director of the international research institute, IMDEA Networks, and is also a Full Professor at the University Carlos III of Madrid (UC3M). Arturo has directed or contributed to 53 different research and technological developments including many centred on 5G technology. Since 2015 he has been the Vice President of the 5TONIC 5G Co-creation Laboratory in Madrid which IMDEA Networks founded in partnership with Telefonica. The 5TONIC laboratory is focussed on the development and testing of 5G technologies and solutions in partnership with its member companies and collaborators from different vertical market sectors. 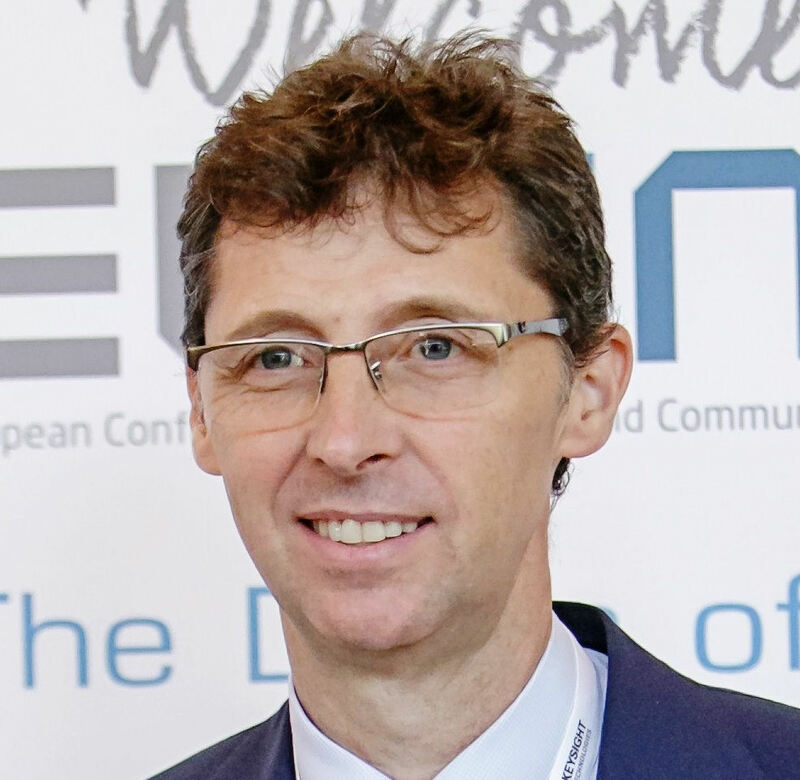 He is an IEEE Senior Member, an ACM SIGCOMM Member and a member of the Partnership Board of the European 5G PPP.